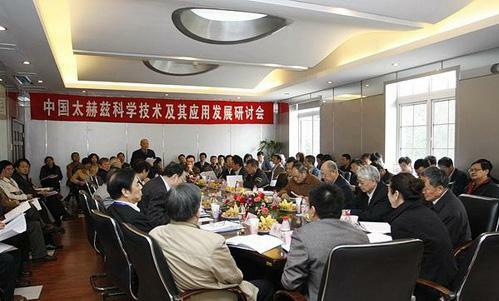 Sixteen academicians of CAS (China Academy of Sciences) and researchers from numerous national research institutes as well as entrepreneurs gathered in UESTC to hold a seminar on China Thz S&T and its application from 26th to 27th April, 2010. They discussed how to construct the “Chinese Road” and put forward significant suggestions for the development of China Thz S&T. The participants included Mr. Chen Fang, the vice-director of Sichuan S&T Department, Mr. Liu Xiaoliu, the director general of Chengdu S&T Bureau, Prof. Wang Jinsong, president of UESTC, who made a welcome speech to celebrate the opening of the seminar. They showed great concern and support to the development of application of Thz. Other leaders participated were Mr. Yang Xiaobo, vice-president of UESTC, Deng Longjiang, chief of S&T section in UESTC as well as Mr. Xu Jianhua, the dean of Physics and Electronics College. The sixteen academicians of CAS in this seminar including Chen Jia’er, Zuo Tieyong, Yang Guozhen, Fan Mingwu, Fan Dianyuan, Guo Guangcan, Chen Guoliang, Tu Mingjing, Wu Yicheng, Rong Tingzhao, Zhang Xixiang, Wu Peiheng, Yao Jianquan, Chen Xingbi, Li Yuemin, and Liu Shenggang. There were dozens of scholars from Institute of Electronics (CAS), Shanghai Institute of Microsystem and Information Technology (CAS), Institute of Physics (CAS), Nanjing University, Southeast University, Institute of Optics and Electronics (CAS), Beijing University of Technology, Zhejiang University, Capital Normal University, Sichuan University, Shenzhen University, Nankai University, Xi’an University of Technology, Hunan University, Shanghai University, and UESTC. The enterprises included Nanjing Chenguang Group Co., Ltd. of China Aerospace Science and Industry Corp., Sichuan Chengguang Yuhua Thz Electronic S&T Co., Ltd., and China Thz R&D Network. The seminar aimed at the discussion of the development trend of Thz S &T in the world so as to promote China Thz research and application. The report “Suggestions on the China Thz S&T Development” made by academician Liu Shenggang touched the pulse of Thz research in Europe, America, Japan and Korea with his wide visual field as well as full and accurate data. Furthermore, academician Liu compared that with the related research situation in China and proposed that more efforts and supports should be put into the research of THz. It’s also the job of academia to call for Chinese government’s attention. After the heated discussion of this topic, the experts and scholars agreed on the discussion draft of the document “Suggestions on China Thz S&T Development”. This document brings forward that Thz S&T provides a powerful new method for scientific research, which will play a significant role in promoting national economic development. Its unique advantages on homeland security and anti-terrorism technology are the basis of new generation of industry. Therefore, due to its significance, since the end of 20th century, more and more efforts have been put into the research of THz outside China. Therefore, the draft analyzes the current situation of Thz research in China, suggests setting up national Thz S&T research projects, establishing two five-year-plan in this field, and calls for more investment. With the optimization and integration of prominent research entities in China, key projects and core technologies with independent intellectual property will be progressed. Meanwhile, a group of Thz research team should be formed so as to quicken the industrialization of technical output, break the foreign blocking, promote Chinese position in the field of Thz research internationally and lay a strong foundation of Thz S&T industrialization and development in China.